Would you like to take a more active part in Mensa? Congratulations to Maria and Mark and everyone involved in the production of this newsletter. 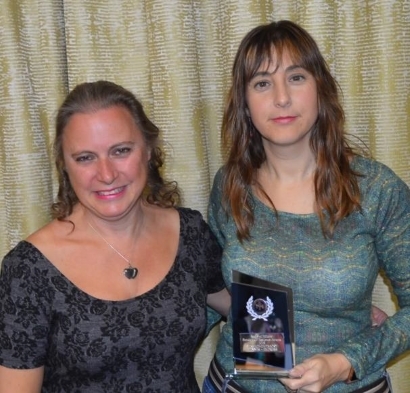 I’m thrilled to say that Empress won the award in the service category at the Regional Newsletter Awards ceremony that took place during the annual Regional Officers/Editors conference. 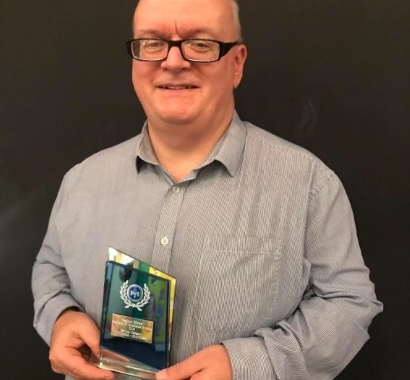 On presenting the award it was stated that it was given for “comprehensive information about what’s on in the region coupled with good input from the Regional Officer to provide a practical link between officers and members”. Please remember that all officers and editors are volunteers and give up their own time to fulfil these roles. I’m delighted that we won something in recognition of our efforts. At the conference I learned that the East Midlands is the 3rd largest region of British Mensa with almost 10% of the membership. Only London and the South East have more members. Interestingly around 40% of those people who sit the Mensa test achieve a high enough score to be invited to join our society and of those around 85% do actually join. The more events we organise, the more members will be encouraged to join in rather than just read Mensa Magazine. You are more than welcome to host a one-off event and myself or your Local Officer will gladly help. If you’re doing something or going somewhere anyway, why not invite others to join you and make some new friends in the process? Members from Derbys/Leics/Notts and beyond will be joining the Christmas party night at the Jurys Inn East Midlands Airport on Saturday 8th December. A mulled wine reception followed by three course festive meal and disco costs £24.95. As several of us are staying overnight there may be some ad hoc events during the weekend so please keep an eye on our Facebook and email groups. Having woken to heavy snow after our Christmas party last year, I’m reluctant to make any definite plans too far in advance! As always, you can contact me on [Phone Number] or [Email]. I wish you and your family a happy and healthy festive season and look forward to seeing you in 2019. Welcome to the December Edition of Empress. My last one for now as Mark returns for the following months. 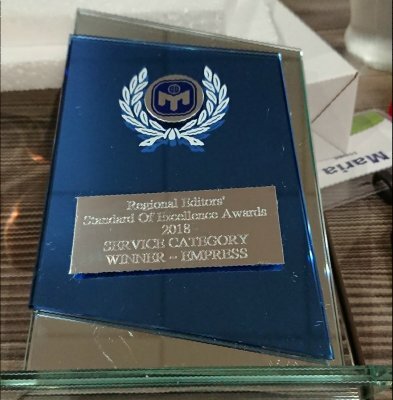 A BIG congratulations to everybody for making Empress win the Service Award 2018. We also won it in 2016 . This award is to recognise the great work of everybody who organises events and us, Mark, Maxine and I for putting them together every month. If you attend any event this month, don’t forget to mention it to your host. It would be really appreciated it. We have a few Christmas parties taking place and a walk, if you wish a bit of fresh air and some exercise between party and party. See you in three months. Merry Christmas and a Happy New Year! Join us for our traditional pre-Christmas curry at the Chutney Ivy Indian restaurant, 41 Halford Street, Leicester (opposite the Curve Theatre). For more information about location, car parking and menus please consult the restaurant’s web site at www.chutneyivy.com. I shall be waiting for you in the restaurant from 6:45pm. Please let me know if you would like to come by 26th November on [Phone Number] or by email at [Email]. Please note change to first Saturday (due to upcoming Christmas Market ) at the Adam & Eve Tavern, 25 Lindum Road, LN2 1NT (opposite Pottergate Arch). We'll have a discussion around “Which murderer do you most admire?”. Car park, pub food, all welcome. Look for Magazine on the table. Contact Jacquie on [Phone Number] or [Email] for encouragement or more details. Join us for “blowing the cobwebs off”, walking west from Skellingthorpe Heritage Centre car park, LN6 5UT. Please meet at the end farthest from Lincoln Road. All welcome, but please contact Jacquie for more details and so she knows to look out for you: [Phone Number] or [Email]. A short drive from the walk venue is the Swan Holme Tavern on Doddington Road, LN6 3RX, where we will go for a meal afterwards. You are very welcome to join us directly there but please let Jacquie know – details as above – by 20th December so that she can book a table. We'll be at the Vat & Fiddle pub on Queensbridge Road (NG2 1NB) for a drink and chat. Come for a cup of coffee or a few pints of real ale brewed at Castle Rock next door. Look for yellow Mblem on the table. Free parking outside and near train, tram and bus. Contact Maxine on [Phone Number] or [Email] for further information or just turn up on the night. Booking essential for this month's festive get together at the Cadland pub/restaurant in Chilwell. £15.49 for 2 courses or £17.99 for 3 courses. Please contact Maxine on [Phone Number] or [Email] for menu and to check availability. Join our growing group for food and/or drink at the Prince Rupert, Stodman Street, Newark, NG24 1AW. Look for yellow Mblem on table usually in room to right as you enter the pub. Directions/encouragement from Pete on [Phone Number] or [Email]. New faces always welcome! Sorry, no eating meeting this month as it falls on Christmas Day. Normal service resumes in 2019! Just one meeting this month - our usual breakfast/brunch at the Rendezvous Coffee Shop, Market Walk, Northampton Town Centre. Pete will have a special Christmas Quiz and we'll discuss the most important/interesting/horrendous event that's happened to us during 2018. Contact Marianne [Phone Number] or email: [Email] for encouragement. We won't be doing the Barge quiz this month as we're not sure they run it in December. Normal service will be resumed in January. Join me for Sunday lunch at Elaichi Restaurant at 188 Cressex Road, HP12 4UA. Sunday Special menu at £9.95. Details at https://elaichihighwycombe.com/ I will need to book, so please contact me on [Phone Number] or [Email] by Friday 23rd November to reserve a place. Dinner and disco at Jury's Inn East Midlands Airport for £24.95 per person. Overnight accommodation available if required. Contact Maxine on [Phone Number] or [Email] to check availability and see menu. We will be at Bretby Garden Centre near Burton on Trent (DE15 0QS) for late lunch / early tea and cake plus some indoor shopping/browsing. Meet at 2pm in the restaurant, look for the yellow Mblem. Please contact me on [Phone Number] or [Email] if you are thinking of coming so I can look out for you. We'll be on a group of tables in the rear section of the Standing Order (Wetherspoon) pub on Iron Gate. Look for the yellow Mblem. Drop in briefly or stay all evening for food and/or drink and chat. Christmas menu available but not compulsory. New faces especially welcome. Contact Susan’s stand in, Mark, on 07989 501441 or Susan on [Email] for directions and encouragement. We have a number of vacant roles. If you are interested and would like further information or a no obligation chat, contact Maxine. The answers from the animal quiz in the October issue were bird, Edith Piaf, triceratops, snake, Napoleon, 4 years, The Osmonds, Scout, capybara, boot, Deputy Dawg, crocodile, Laika, leatherback, mob, chimera, Tibet, 4, Sandy and shrike. Lots of entries this time with everyone scoring 20 out of 20 placed in a hat and Nigel Bryant of Bedford being drawn at random – again! This month we have a Christmas quiz. Please send your answers to arrive by 15th December (note earlier closing date) to [Address] or [Email] remembering to include your name and address in case you win the £10 book token. 1. Which country started the tradition of putting up Christmas trees? 2. Which reindeer’s name begins with the letter B? 3. Christmas Eve is the name of a character in which stage musical? 4. Who wrote the poem ‘The Cultivation Of Christmas Trees’? 5. Which US state was the first to recognise Christmas as an official holiday? 6. Which Australian city was hit by Cyclone Tracy on 25th December 1974? 7. How many gifts would you receive in total if you got everything in the ‘12 Days Of Christmas’ song? 8. Which company was first to use Santa Claus in an advert? 9. What is the capital of Christmas Island? 10. Which festive food is made from marsh-whorts? 11. On which date is Christmas celebrated in Armenia? 12. Which German city was once known as the ‘gingerbread capital of the world’? 13. In ‘A Christmas Carol’ what was Scrooge’s first name? 14. Which Englishman banned the singing of Christmas carols? 15. What colour are the berries of the mistletoe plant? 16.	Who composed the music to the song ‘Silent Night’? 17. Frosty the snowman’s nose is made of what? 18. What was the best-selling Christmas toy in 1980? 19. Which airport was taken over by terrorists on Christmas Eve in the Die Hard film? 20. What is the most popular restaurant that Japanese visit for their Christmas Day meal?